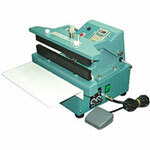 An impulse sealer is a type of bag sealer used to close plastic bags and poly-tubing with heat. 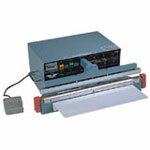 Impulse sealers are ubiquitous to most industries and packaging operations. Hand impulse sealers are more commonly found in lower volume applications. 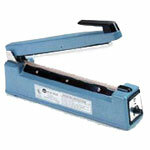 A standard heat sealer will close a plastic bag up to 6 mil thick. A 5mm seal provides a stronger seal and can be used on bags up to 10 mil thick. It is important to understand that a heat sealer with a cutter should be used for poly-tubing. Another rule of thumb is to purchase a sealer that is 2 inches larger than the widest bag that needs to be heat sealed. The extra inch on each side of the bag will allow a strong seal and faster operation. 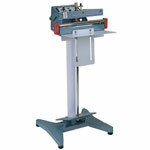 A foot sealer should be considered for moderate volume applications and a band sealer for high volume. Boatman Marking offers a wide variety of impulse sealers for a spectrum of different packaging needs.